Argentine soccer great Diego Maradona was known for his outstanding soccer career on the field, and unfortunately his missteps off it. The FIFA World Cup legend is ready to bring the incredible story of his soccer career and controversial personal life to the big screen for all to see. The 55-year-old legend has agreed to terms with BTF Media to share his incredible journey. “My life has been a roller coaster and I want to share an honest account of my experiences, therefore there was no better production house to do it with than BTF. I am certain that they will tell my story with the quality and sincerity it deserves. It has been a very organic process working alongside Francisco Cordero and Mari Urdaneta in a detailed recollection of my life through a series of interviews. I am fully supporting the production and providing them my know- how and life details,” said Maradona. Maradona became a hero for his national team in 1986 when he helped lead the Argentina National Team to a World Cup championship over West Germany. In the process, Maradona scored some of the most amazing goals soccer fans have ever seen, and he is constantly compared to Pele, arguably the greatest player ever. Maradona has won the World Cup, lost a World Cup final and he has certainly had his issues off the field. He has also been suspended from national team play because of drug use, he has involvement in politics, and he has played in several domestic leagues around the world. 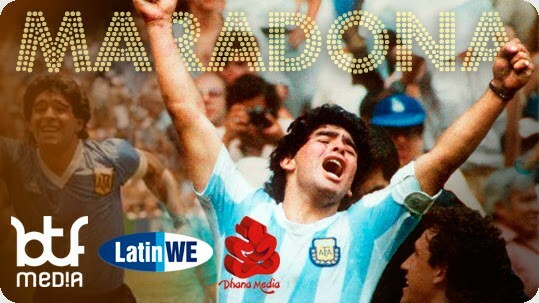 All of those factors combined make Maradona one of the most interesting and captivating athletes of the 21th century.